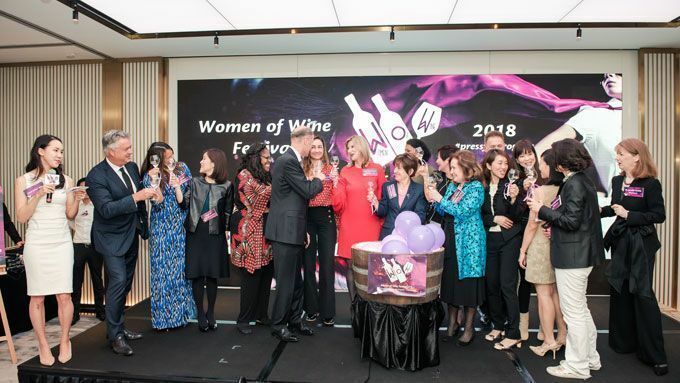 Hong Kong’s Women of Wine Festival (WoW) wowed audiences in Hong Kong last night, attracting a record crowd of 450 guests, who sipped on over 100 wines made by female winemakers from around the world, and enjoyed a variety of inspirational seminars, wine tasting workshops, networking, pop-up events and more. Hosted by Master of Wine, Debra Meiburg MW at the exclusive new The Murray, A Niccolo Hotel, this was the first official International Women’s Day event in Hong Kong, ahead of the official day on 8 March. To launch the event, media and VIP guests, including Ms. Gaëlle Goossens, Veuve Clicquot, Mr. Duncan Palmer, Managing Director of The Murray, Hong Kong, a Niccolo Hotel, Ms. Maria Perez-Ribes, Deputy Consul General and Commissioner for Economic & Commercial Affairs, Spain, toasted the official #PressForProgress theme by pressing a barrel of “grapes” onstage to officially open the event. At the festival, guests enjoyed seminars including: “Future Leaders – Modern Leadership and Defining Your Leadership Style” and “Next Gen – Next Decade’s Top Industries & Growth Opportunities to Prime Your Career”, featuring star-studded panels of Hong Kong top business people and industry leaders. Two wine education tasting workshops offered in-depth wine education to guests. Wine Workshop 1 “Rethink Pink – Explore and Celebrate 200 Years of Rose Champagne, featuring Veuve Clicquot”, was hosted by visiting Veuve Clicquot Winemaker, Gaëlle Goossens, while Wine Workshop 2 “Old Vs New - Discover Classic & Trending Wines from Key Wine Regions” was hosted by Sarah Heller MW – Asia’s newest Master of Wine, and currently the world’s youngest. The opening ceremony also featured an exclusive news announcement by Veuve Clicquot. Along with Gaëlle Goossens, Winemaker of Veuve Clicquot, Debra Meiburg MW announced the 2018 launch of the globally renowned Veuve Clicquot Business Woman Award into Hong Kong. The Award was created in 1972 as a tribute to Madame Clicquot – widely regarded as the world’s first female entrepreneur and legendary innovator in Champagne. Now operating in 27 countries, the award has recognized more than 350 women. 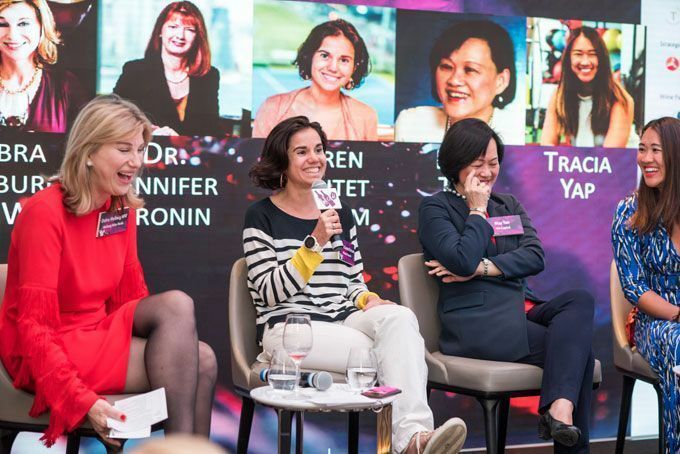 Judged by an esteemed Jury – a panel of five exceptional business people, and an advisor – the Veuve Clicquot Business Woman Award will be announced at an award ceremony in Hong Kong in October. Master of Wine Debra Meiburg MW, founding director of MWM Wine School and Meiburg Wine media said, “It was my great pleasure to launch the 2018 Hong Kong Veuve Clicquot Business Woman Award in the presence of such esteemed business women from an incredibly diverse mix of backgrounds and industries. We can’t wait to announce the finalists and winner of the award later this year. “WoW attracts such a wonderfully diverse mix of attendees; from corporate colleagues, to ambitious young women, to seasoned wine geeks, to some of Hong Kong’s most revered trailblazers in the arts, film, finance, fitness tech and more, all drawn together by a passion – be it casual curiosity or outright obsession – for wine! • Ms. Debra Meiburg MW – Founding Director, Meiburg Wine Media & MWM Wine School; Chair, Education Committee, Institute of Masters of Wine; Wine Consultant, Cathay Pacific Airways & Cathay Dragon.